Directors are quick to note that films can be found in the editing room. As I’m reading through Ray Carney’s Cassavetes on Cassavetes, John Cassavetes discusses the process in which his debut film Shadows was pieced together from roughly 60,000 feet of stock footage. The struggle to find a film within the editing room is something worth considering as the multiple stages of filmmaking can cloud even the sunniest visions. From an idea’s genesis comes the writing process, where thoughts are expanded and homogenized. What follows are the glaring financial issues associated with a production. There’s casting and the subsequent retooling of what’s on paper. Words and sentences and scenes are restructured to befit the mood and tempo of its talent. Shooting wraps up and the daunting task of sifting through footage to construct a film begins. With George Clooney’s The Monuments Men, the ideas were in place, along with exceptional talent both in-front and behind the camera. But the faults stem from the hodgepodge construction of the picture, where the film struggles to define fundamentals like tone and pacing, let alone thematic intent. One of the oddities of film criticism is the idea that an auteur is not allowed to touch upon familiar territory. Jean-Pierre and Luc Dardenne tend to be criticized for their recognizable method of storytelling and direction. Similarly, as I read reviews for George Clooney’s latest directorial effort, critics are skeptical of the timely significance of The Ides of March. The general criticism of the film stems from the idea that The Ides of March does not necessarily say anything new; politics are dirty and therefore seeing it in play offers little surprise. But what critics fail to recognize is that while Clooney’s observations on politics may not be groundbreaking, the sheer confidence and bravado he brings to realizing his concept allows the audience to derive new meaning from the proceeding. Case in point, The Ides of March functions as an astute exercise in maintaining filmmaking as it mounts tension and balances tone expertly on a political field. The Ides of March plays into the sort of character study where moral decay serves as the prevailing factor in surviving. The screenplay is very deliberate in the manner it presents its characters; you gather there are two forces in the fight, one of idealistic naivety and the other of underhanded cynicism. But as if the dust has not yet settled, you don’t get a handle as to where everyone falls quite yet, with the exception of its lead character, Stephen Myers (Ryan Gosling). Gosling fits the mold of an idealistic youth, and as assistant campaign manager to Governor Mike Morris (George Clooney), you sense his admiration for the theoretical implementation of politics. He is invested to the cause, with his idealism heavily influenced by Morris’ Obamaesque magnetism and charm – you gather a change is coming, wherein the dirty method of politics will be of old. But such is not the case, as the film tests Myers’ commitment to the cause through a series of twists and turns that establish the notion that politics create jaded, corrupt and cynical people. The ideas of the narrative may not be revelatory, but the way in which Clooney frames and uses his actors elevates the material immensely, to the point that you are totally immersed into the rabbit hole of moral decay you’ve been dug yourself into. It works on a variety of levels, particularly due in part by an amazing acting ensemble. Every actor has their scene to steal, and while this is largely based on the structure of its source material, it makes for a sharp transition on-screen. The perpetual slyness of Ryan Gosling, the underhandedness of Paul Giamatti, and the harshness of Philip Seymour Hoffman all make for an incredibly strong acting presence. 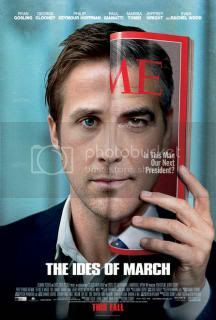 Had The Ides of March been released prior to the Obama campaign, one would have likely disregarded the film for its flagrant cynicism; now it’s simply not cynical enough and states the obvious. But what The Ides of March does achieve is a sense of overarching timeliness. Is the film relevant? Absolutely. The allusions to the Obama campaign are many and overt. Is it revelatory? Yes, though not in its politics. It’s revelatory in the way Clooney has been able to effectively knit together so many talented actors into the finest ensemble performance of the year. It’s revelatory in the way it tells a very simple story and manages to squeeze tension and excitement out of the proceedings: it’s simply a very good film, political philosophy notwithstanding.